Building/construction site health and safety hazard spotting cartoon. Hazards on a building site/construction site environment. Spot the health and safety hazards picture. Building/construction site health and safety hazards cartoon. Hazards on a building site/construction site environment. Spot the health and safety hazards cartoon. 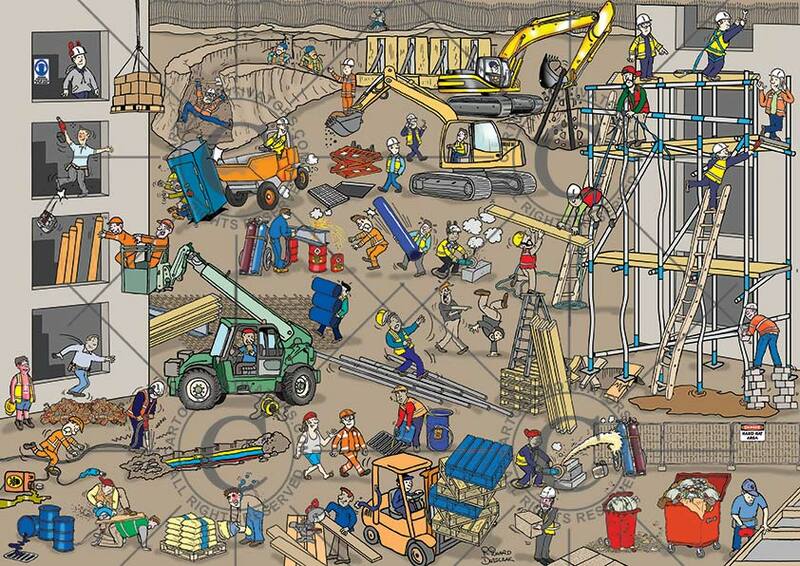 Numerous health and safety hazards illustrated in this building/construction site hazards cartoon. Health and safety cartoon for training purposes - ask your staff how many hazards they can spot? Can you spot the hazards in the warehouse? Educate your warehouse staff with this cartoon - health and safety cartoons can save accidents. another digger accidentally digging up power cables, worker of scaffold not using safety harness, guy on scaffold using mobile/cellphone, worker over reaching on ladder, ladder defective rungs bent or missing, guy on scaffold reaching down for scaffold plank, another worker passing a scaffold plank up - he's stood on a stepladder which is on top of some pallets, scaffolding erected over holes and soft muddy ground, worker stood on concrete blocks instead of using proper equipment, worker with nail gun who's other hand could be injured by nail, over flowing waste bins with food waste, worker grinding metal without face shield/visor sparks landing on gas bottles, danger hard hat area sign - not many wearing hard hats, worker twisting incorrectly while moving heavy blocks, fork lift truck driver without sea belt - load stacked unsafely, worker pouring hazardous chemicals down drain, guy walking on pipes slipping, two workers horsing around, worker cutting a concrete block not using his PPE, guy on site walking talking on phone, worker carrying plastic pipe hitting another worker over head welder cutting girder which is rested on highly flammable liquid drums, worker carrying too much can't see where he's walking, guy over reaching from elevated work platform, driver not concentrating, guy jumping out of window as a short cut, worker sunburnt not wearing the correct clothing, worker with jack-hammer near underground gas and water pipes, guy tripping on power tool cable, spilt chemical container, oil drum leaking into drain, worker using guys back to cut wooden plant with saw, guy incorrect lifting hurting back, worker in sandals incorrect work wear, power extension cable/cord faulty, guy using mitre/miter saw without guard or PPE. A2 in size 59.4cm x 42cm deep. Ideal for training staff/workers/colleagues to be more safety conscious on a building/construction site. File size is nearly 28MB so please be patient when downloading. *I am happy to work with you and make amendments to this cartoon to better suit your needs please contact Richard to discuss your exact requirements. I'll give you a quote for the required work once I know what is needed. Also available to create bespoke hazard spotting cartoons for any industry!